One of our recent commissions deviated from our usual laser engraved wedding rings. 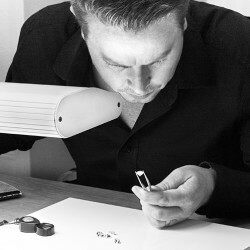 Hand engraving carves the surface of the ring, whereas laser engraving burns the surface with precision. Hand engravings demonstrate an artistic element, executed by highly skilled artisans, capable of replication patterns and designs onto an item of jewellery. Leaf patterns have always been a popular decorative pattern for jewellery. Intricate vine patterns feature amongst iconic jewellery eras, including the Art Nouveau Period of jewellery design. Hand engraving allows a repeating pattern to be applied on the inside or outside of a wedding ring—perfect for both bride and groom. Both rings were crafted in 18ct Fairtrade Yellow Gold, giving our client complete assurance that their wedding rings were responsibly sourced from 100% ethical Gold. 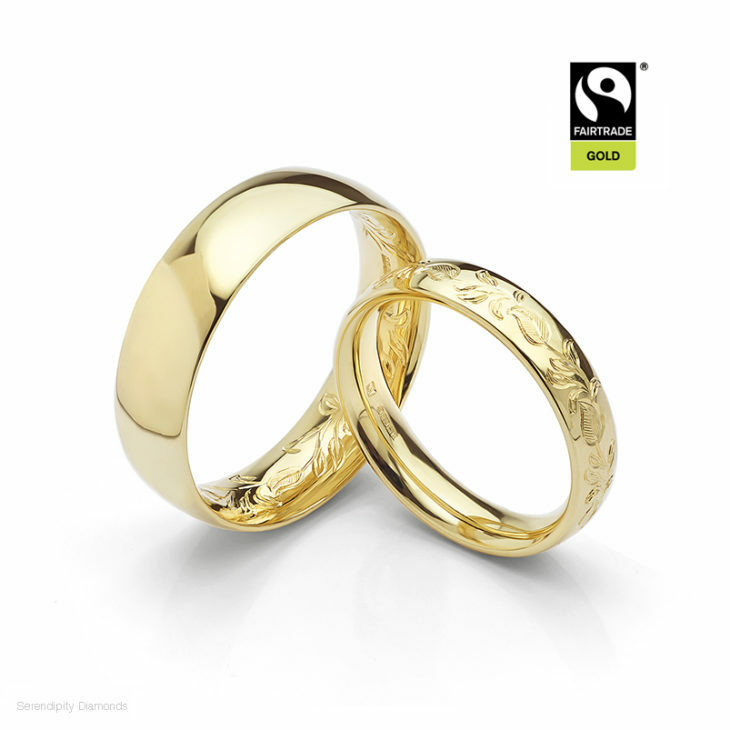 The Fairtrade logo appears alongside the hallmark in the completed leaf patterned wedding rings. The Groom’s wedding ring remains plain in appearance, with the decorative leaf engraving on the inside of the ring. Beautifully matched the engraving remains hidden from view during day-to-day wear. If you would like to view more examples of our engraved wedding rings, please feel free to browse some of our previous engraved wedding rings on our main website.